You might think you are looking at a regular elevator. Technically, you are. It's the stickers, promoting a new adult video game, that give it pizzazz. Would you like to step inside? 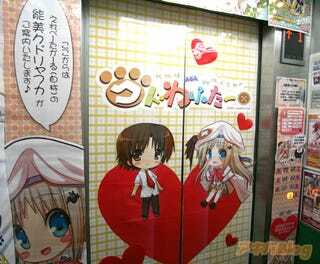 This elevator is located at the Gamers retail shop in Akihabara. The computer game, Kudo Wafter, is rated 18-and-up. This elevator, however, is not.